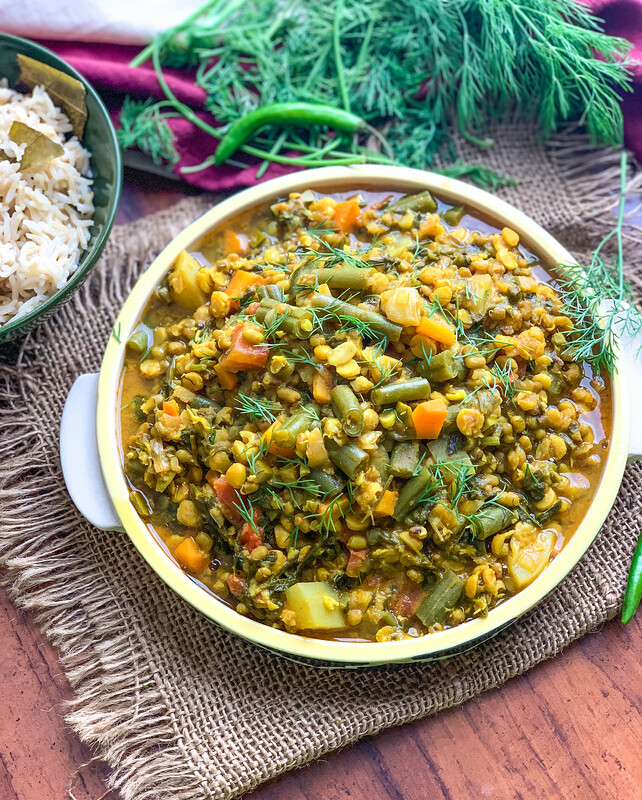 The Sindhi Sai Bhaji Recipe is a high protein sindhi dal recipe that is packed with flavors from the fresh vegetables, spinach and dal all cooked together with spices to make a delicious one pot meal. 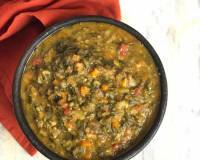 A traditional Sindhi recipe - the Sindhi Sai Bhaji Recipe, is a healthy yet delicious one pot dish, that is popular in almost all Sindhi households. A wholesome dish that's packed with lentils, greens and a pot load of other seasonal vegetables. A nutritious and a balanced meal, it is cooked to perfection with just the right amount of spice and tempered with ghee and garlic. 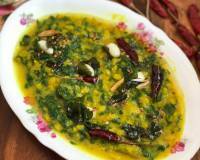 This dish can be had as a meal in itself or served with phulkas or rice. 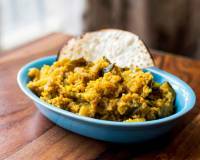 The Sai Bhaji in itself makes a wholesome diabetic meal on its own and you can serve it optionally along with Bhakri for a diabetic lunch or dinner. 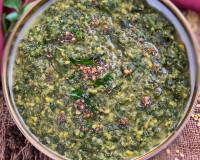 The addition of Spinach, Methi, Vegetables and all the dals, makes it a fibre rich and protein rich meal for diabetes. 'Sai" in Sindhi means 'green' and 'bhaji' like we all know means vegetables. 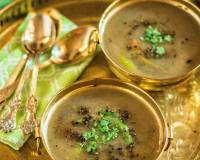 Serve this Sindhi Sai Bhaji Recipe with Sindhi Koki and Sindhi Bhuga Chawal Recipe and Lauki Raita Recipe for a complete Sindhi Rasoi-meal. 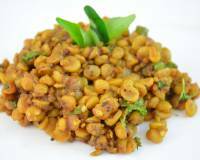 You could also serve Sindhi Sai Bhaji Recipe along with Jowar Jo Dodo Recipe - Sindhi Sorghum Roti and Gajar Shalgam Ka Paani Wala Achar Recipe for a simple weekday lunch. 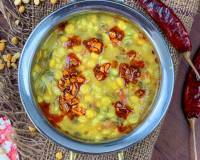 To begin making the Sindhi Sai Bhaji Recipe, wash and soak the chana dal and split green moong dal for about 30 minutes. Wash and chop all the required vegetable and greens for the Sindhi Sai Bhaji Recipe. In a pressure cooker, heat ghee on medium flame, start by adding the onions, saute for a couple of minutes. Next add ginger, garlic and saute for a couple of minutes. Add the tomatoes and cook until mushy. This will take about 2 minutes. Once it is done, add the remaining ingredients including turmeric powder coriander powder, red chilli powder, raw mango, green chilli, spinach leaves, methi leaves, dill leaves, chana dal, green moong dal, carrot, green beans, bottle gourd etc. Saute it for about 4 to 5 minutes. 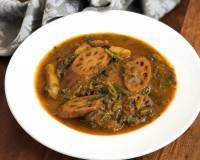 You can also add other vegetables of your choice such as Brinjal, tinda etc in this Bhaji. Add salt to taste and 3 cups of water, close the lid and pressure cook the Sindhi Sai Bhaji for 15 to 20 minutes. Switch off the heat and allow the pressure to release naturally. Open the lid and mash the Sai bhaji using a potato masher to bring it to a mushy consistency. Serve this Sindhi Sai Bhaji Recipe with Sindhi Koki (Sindhi Style Flaky Flatbread With Onions) and Sindhi Bhuga Chawal Recipe and Lauki Raita Recipe for a complete Sindhi Rasoi-meal.